For a moment Wednesday, it seemed like the environment, unlike nearly everything else in Washington, was a nonpartisan topic. Ninety-eight senators voted to pass a resolution declaring that “climate change is real and not a hoax.” (Republican Roger Wicker of Mississippi was the lone no vote.) The vote was meant to force Senate Republicans to take a stand a day after President Obama critiqued Republicans for refusing to acknowledge the scientific consensus that climate change is happening due to human activity. (Republicans cut Obama’s jab from their “enhanced webcast” of the State of the Union speech.) Those 98 votes would seem to be a sign that Republicans had taken Obama’s criticism to heart. Another amendment by Hawaii Democrat Brian Schatz stating that “human activity significantly contributes” to climate change garnered 50 votes, including those of Republican Sens. Lamar Alexander of Tennessee, Kelly Ayotte of New Hampshire, Susan Collins of Maine, Lindsey Graham of South Carolina and Mark Kirk of Illinois. But it failed to get the 60 votes needed to pass. Climate change is as partisan outside Congress as it is inside it. 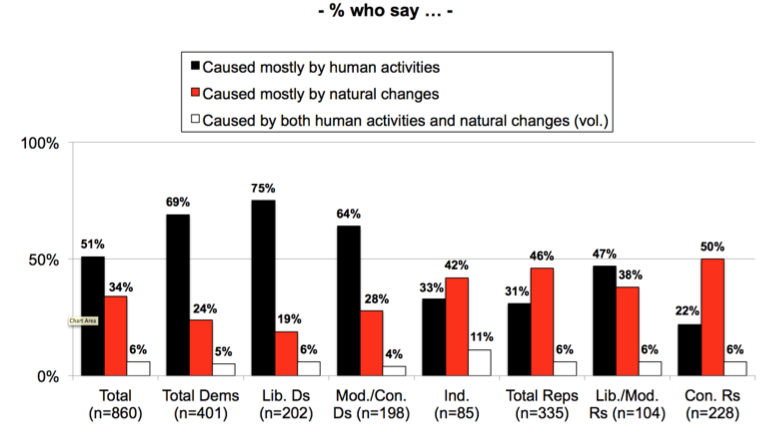 Findings from a nationally representative survey conducted by the Yale Project on Climate Change Communication and the George Mason University Center for Climate Change Communication last April (the charts below are from that survey) show that while a majority views global warming as real, Republicans are far less likely to support that view than Democrats and Independents are. In that sense, Congress is more united than the electorate. This week’s posturing hints that Democrats plan to exploit the climate change issue in the next election. Polling suggests that may be a promising strategy. A USA Today poll conducted in November found that 63 percent were in favor of President Obama’s agreement with China to stem global warming. 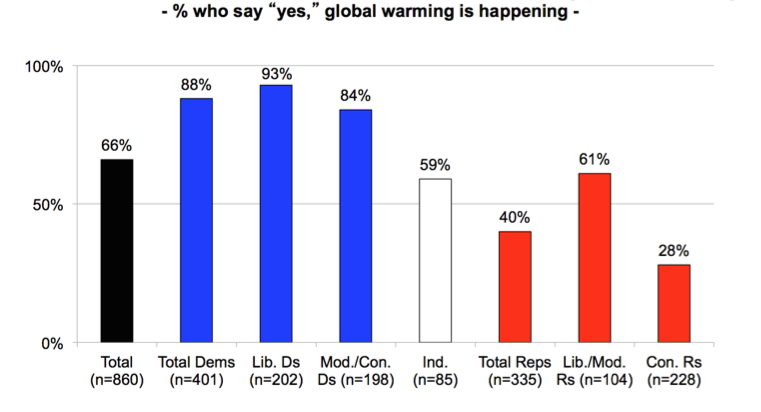 A nationally representative survey of 860 registered voters conducted on April 11-24, 2014 by the Yale and George Mason groups found that a majority of voters — Democrats, liberal and moderate Republicans, and Independents — are more likely to vote for a congressional or presidential candidate who strongly supports action to reduce global warming. “Only conservative Republicans are less likely to vote for such a candidate,” the report said. Still, the researchers found a diversity of views among Republican voters. Self-identified moderate and liberal Republicans compose about a third of the party, and 62 and 68 percent of these respondents, respectively, told surveyors that they thought global warming is happening. That’s compared to 38 percent of conservative Republicans and 29 percent of tea party Republicans who agreed that global warming is real. Of course, science doesn’t work by popular vote. But the debate over climate change has never been about science, and that’s unlikely to change anytime soon.